Xg Portfolio – Grid maronary portfolio filter plugin is a modern Plugin. 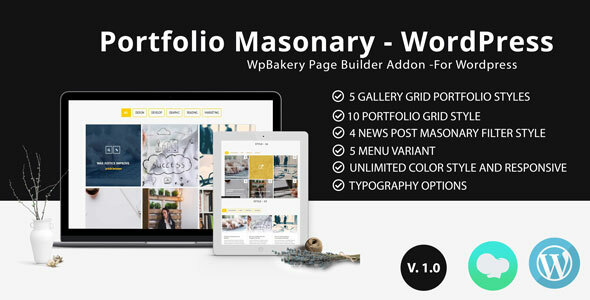 It’s have 5 Gallery grid portfolio styles,10 Portfolio grid style, 4 news post masonary filter style, 5 menu variant with huge option. You can use this Xg Portfolio – Grid maronary portfolio filter plugin on your website easily. 1. Count : Enter How Many Inte you Want To Show In the portfolio masonary . 2. Menu Style : Select menu style for portfolio masonary . 3. Grid Column : Select Gird Column for portfolio masonary . 4. Menu Align : Select menu alignment for portfolio masonary . 5. Menu Font size : Enter Menu Font Size for portfolio masonary . 6. Icon Font size : Enter icon Font Size for portfolio masonary . 7. Title Font size : Enter title Font Size for portfolio masonary . 8. Sub Title Font size : Enter sub title Font Size for portfolio masonary . 2. Icon Background Color: You can select icon background color. 3. Icon hover Background Color: You can select icon hover background color. 4. Icon hover Color: You can select icon hover color. 5. Title Color: You can select title color. 6. Sub Title Color: You can select subtitle color. 7. Menu Color: You can select menu color. 8. Menu hover Color: You can select menu hover color. 9. Menu Background Color: You can select menu background color. 10. Active Menu Color: You can select active menu color. 11. overlay Color: You can select overlay color. Credits A big thanks to following source. Poftfolio masonay add-on wouldn’t be possible without these source.